Cooper is a very loving male yellow lab who is very focused on his ball, or any other object you want him to bring back to you! 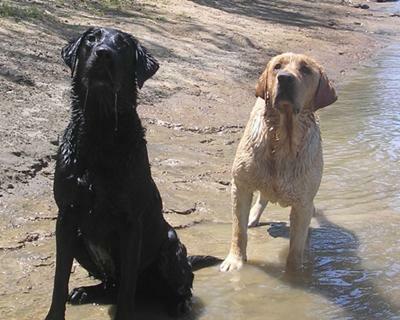 He loves swimming and can dive under water over SIX FEET DEEP to retrieve an object he wants! He gets up extra early to go duck hunting and what ever you do DO NOT LET HIM THINK YOU ARE GOING TO HURT HIS OWNER! My 8 year old daughter. Santa Claus made an appearance 2 years ago and gave Cooper to my Daughter and my wife straight out of his sled in front of her entire family on X-MAS eve. He has been joined by Montana who is Black, but has the yellow gene from one of her parents so she will have yellow pups along with black ones. They are not pets, but true loyal family members!